Sitting in the entrance to her hut, Uma Kali is trying to calm her one-year-old son. Severely malnourished, Ram is on the verge of death. Starvation has caused the skin on his lower body to shrivel, his arms and legs are stick-thin and his pitiful whimpers are painful to hear – he is too weak to cry properly any more. “The mind goes crazy looking at your child in this state,” says Kali, who is clad in an old purple sari and tattered pink blouse. A tour of the tribal village of Maduhilai, in the central Indian state of Madhya Pradesh, swiftly reveals that Ram’s malnutrition is not an exception. Malnutrition is the underlying cause of a third of all child deaths, according to a new Save the Children report, A Life Free from Hunger: Tackling Child Malnutrition. The charity describes malnutrition as a silent killer because it is often not recorded as a cause of death on birth certificates, leading to a lack of action across the developing world. As in Ram’s case, a severe lack of food is usually compounded by diarrhoea or an infection or virus. Other debilitating diseases, such as malaria, also contribute to extremely high levels of child deaths in Madhya Pradesh. Kali, Swatiya and Bhalloo all belong to the Mawasi community, classified as a ‘Primitive Tribal Group’ by the Indian government. Satna district, where the Mawasi tribe lives, has a damning history of early child deaths. 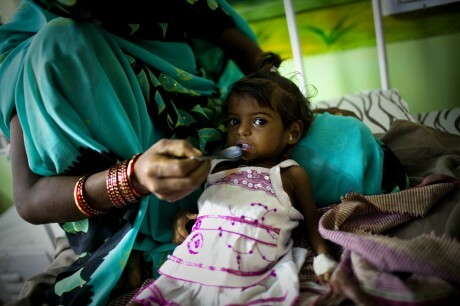 In 2008, Madhya Pradesh made the news after 280 children died of malnutrition in just four months. Each of the deaths took place among tribal communities and the highest number, 72, occurred in Satna. India has pledged to cut malnutrition and child deaths by two thirds as part of its commitment to the Millennium Development Goals. It is failing. With only three years left to hit the targets, in the case of infant mortality India has been declared officially “off track”. Despite its impressive economic growth, India still has some of the highest rates of child malnutrition and mortality in under-fives in the world and Madhya Pradesh has the highest levels in India. In tribal areas of the state it is higher still – 95.6 in every 1,000 tribal children die of malnutrition, compared with 70 in every 1,000 for the state, according to a 2010 report by the Asian Legal Resource Center, an international human rights organisation. More alarmingly, government data shows the gap between tribal communities and the rest of the population is widening. For 15 years, the number of malnourished tribal children has remained almost constant at about 55 per cent, compared with a 20 per cent drop among the rest of the population. The Indian government has poured billions of dollars into welfare schemes, but they have failed to stop the vicious cycle of poverty, illiteracy, unemployment and social isolation faced by India’s 84-million strong tribal population. The emergence of a cash-based economy has sidelined another institution central to tribal people – the barter system. “Since they did not traditionally trade in cash, their ability to procure what they need in the market has gone down. They face a perpetual cash crunch,” says Devy. Shiv Kailash, a lean, 25-year-old Mawasi boy lives in Satna district’s Majhgawan village, home to around 100 families. Ask Kailash what would make his community happy and his responses are far from ambitious. “It would be good if we could get some services from the government to supplement farming,” he says. Kali’s own case is instructive. She has to feed five more children, in addition to Ram. On a good day, she earns about Rs 50-60 (70-85p) working on construction sites. Often she finds no work and sells firewood for a lot less. Under a government rural employment scheme Kali should be earning the minimum wage of Rs 100 (£1.40) per day for 100 days of guaranteed work a year. But there is no work, she says. Meanwhile, Kali claims the Integrated Child Development Scheme (ICDS) – the government’s rural programme to combat malnutrition – is not working properly in her village. “The anganwadi (ICDS centre) hardly opens once or twice in a week,” she says. A visit to centres in Satna and the neighboring district of Chhatarpur reveals empty premises or dirty and broken buildings with missing utensils, medicine and pre-school kits and at their worst, holes in the food packets with dead insects inside. The government doctor who admitted Ram has worked in the tribal pockets of Satna district for 25 years and says there are staff shortages and poor incentives. “The doctors are at their wits’ end,” he said, speaking on condition of anonymity. “All through the 90s, government schools and colleges shut down,” explains T. Sundararaman, who heads a technical support group for the Ministry of Health and Family Welfare. In stark contrast to government efforts a handful of small NGOs have achieved striking successes. In Chhattisgarh, a team of doctors has reduced child deaths by half in 21 villages. In the tribal-populated and conflict-ridden Gadcharoli district of Maharashtra, a doctor duo, Abhay and Rani Bang, reduced child deaths by 56 per cent in 40 villages. In similarly affected districts of Jharkhand and Orissa, another husband-wife doctor duo, Prasanta Tripathy and Nirmala Nair, have reduced child deaths by 45 per cent in almost 200 villages while working primarily with the Ho tribe. Earlier this month the government of India launched a new maternal and child health programme focussing on 250 of India’s poorest and most inaccessible districts in a final push to meet the MDG targets. However, Dr Tripathy cautions against a blinkered approach to targets. He fears that if the government continues to focus solely on achieving the MDGs, without understanding the unique needs of tribal people, these communities could die out. “This is the direction some communities are heading in,” Tripathy says.